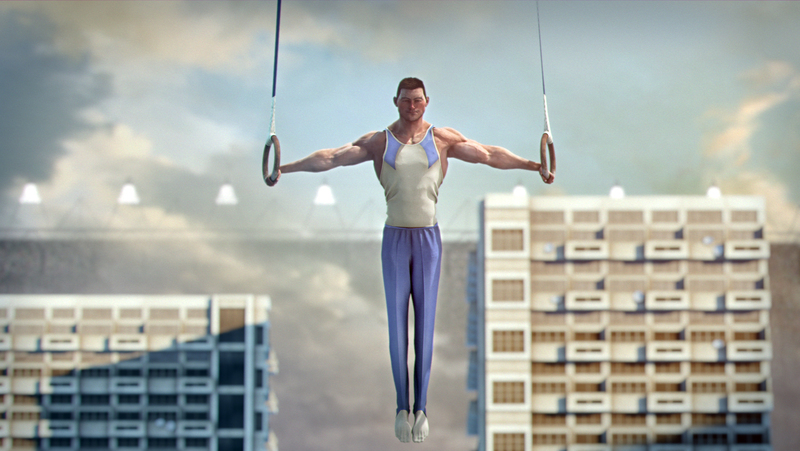 The BBC has unveiled “Stadium UK”, its marketing campaign and title sequences for the London 2012 Olympics. The animated trail shows the landscape of the United Kingdom transformed into a giant sporting arena inside the Olympic Stadium. Designed to be used across all the BBC’s television, radio and digital Olympic content, it features the specially commissioned music First Steps by Elbow. In the integrated title sequences and marketing campaign the UK is seen as a giant stadium with Olympic athletes preparing and competing in quintessential British landscapes showing how every corner of the country is involved in hosting the world’s greatest sporting event. The ident ranges from swimmers in Scottish lochs, sprinters in terraced streets, a BMX rider on a cliff top, a weightlifter preparing dock side, track cyclists racing around quarries, and long jump on beaches, to gymnasts on the streets of London. The ‘Stadium UK’ animation will be used throughout the BBC’s London 2012 marketing campaign, online at www.bbc.co.uk/olympics, as well as being used for the BBC’s London 2012 television title sequences and providing digital imagery for desktop, mobiles, tablets and connected TV content. The full two minute forty second version of the trail premiered at 7.30pm on Tuesday 3 July on BBC One, with 60, 40, 30 and five second versions used throughout the campaign. The BBC Olympics Trail campaign, including the concept for trails, title sequence and digital imagery, was developed at RCKR/Y&R, London, by executive creative director Damon Collins, creatives Jules Chalkley, Nick Simons, Ted Heath and Paul Angus, music supervisor Dan Neale, account directors David Pomfret and Charlie Smith, working with BBC 2012 Marketing team Louisa Fyans, Karen Potterton, Nick Farquhar, and BBC 2012 production team Jonathan Bramley, Dave Gordon, Paul Davies. Production at Red Bee Media was by producer Sarah Caddy and production manager Jane Hunt. Animation was created at Passion Pictures by director Pete Candeland, executive producer Andrew Ruhemann, executive producers Michael Adamo and Hugo Sands, producer Lottie Hope, project development producer Anna Lord, art directors Mario Ucci and Rick Thiele, CG head Jason Nicholas, CG coordinator Helen Lord, VFX supervisor Neil Riley, character modelling team Mario Ucci and Cesar Nunes, environment modelling team Ian Brown, Florent Rousseau, Ander Gutierrez, Gary Newman and Mattias Bjurstrom, rigging team Chris Dawson, Jorge Bellot and Francois Pons, textures team Ellie Bond, Emma Berkley, Nikki Newman, Florent Rousseau, Ian Brown and Gabriel Loques, previs team Xavier Zahara, Mark Brown, Martin Parissenti and Richard Perry, animation team Cath Brooks, Wes Coman, David Sigrist, Florian Mounie, Conor Ryan, Chris Olsen, Mark Brown, Rodrigo Torres and James Farrington, VFX team Jamie Franks, Augusto Lombardi, Ciaran Moloney, Paulin Cointot and Michael Sofoluke, lighting and rendering team Mario Ucci, Rick Thiele, Cesar Nunes, Quentin Vien, Patrick Krafft and Christian Mills, matte painting and concept art team Form Language, Max Dennison, Roger Gibbon, Kim Frederiksen, Diego Goberna, Lukasz Pazera, Daniel Cacouault and Giles Dill, compositing team Niamh Lines, Johnny Still, David Lea, and editing team Anne Monnehay and Jamie Foord. First Steps was written and performed by Elbow, alongside the BBC Philharmonic Orchestra and the NovaVox gospel choir. The music will be used across all the BBC’s Olympic coverage and marketing campaign for television and radio. First Steps by Elbow will be available as a digital only download from 27 July with all profits going to BBC Children in Need and Sport Relief. Elbow has waived all fees and royalties from the digital download and the retailers have waived all profits from the release.